Last night, the Frost School of Music @ the University of Miami held their showcase of Emerging Composers as part of their yearly month of Festival Miami. the New Music Concert featured works by Liza Seigido, Daniel Choi, Richard Yates, Rodrigo Brussad, Jackson Alexander Parodi, Ben Morris and Spencer Robelen and Rachel Dean, and Matthew Evan Taylor. The music was as varied as the composers and featured – at least to my ear – an unusual use of hardware, software and technique. 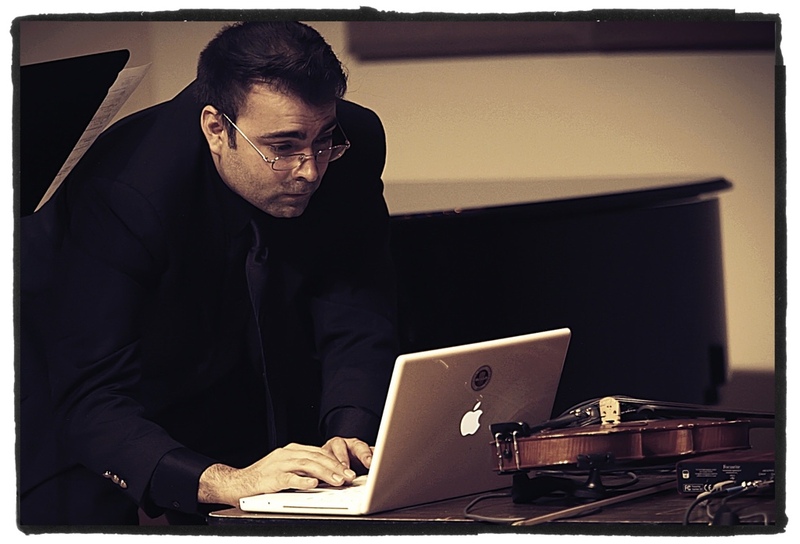 Featured in the image above, David Mendoza performed his piece, Seance, on his violin connected to his computer. In addition to synthesizing some of the music, the computer also added background vocals to add the ambiance of an actual seance. Liza Seigido used her laptop to mix, re-mix, and synthesize her voice at different rhythms, speeds and tempos resulting in a kaleidoscope of sounds that all originated with her voice. As a final example, Rodrigo Bussad composed his “Bodisatva” to be played by using a violin bow on a xylophone and a piano by strumming and hammering on the strings instead of using the keys. What struck me as a photographer was how much the digital revolution has affected music as well as photography. I suspect there may be many parallels to explore between the worlds of digital music and digital photography, especially concerning the attitudes of those of us who make our livings using these technologies. Congratulations to all of the composers! This entry was posted in Clients, Digital Photography, Festival Miami, Frost School of Music, Music, Photography sessions, Uncategorized and tagged concert, emerging composers, entertainment, Festival Miami, Florida, Frost school of music, music, new music, photography, Shawn Clark, showcase, versatile light studio, violin bow. Bookmark the permalink.